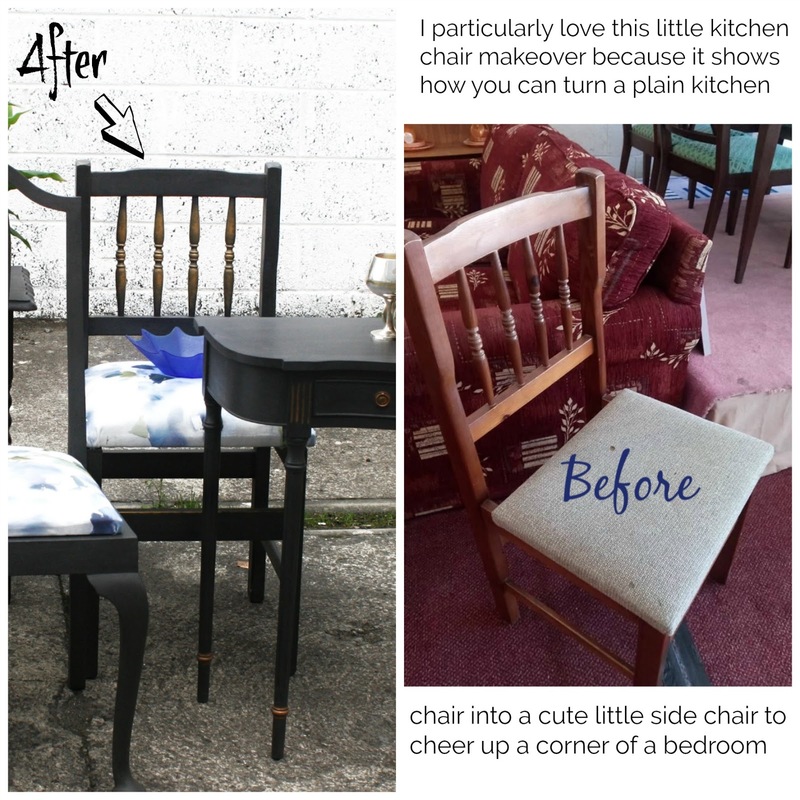 I just thought I'd do a round up of some of the pieces I've been painting and upcycling for Clare Haven Services Charity Furniture Store in Ennis where I volunteer a few hours a week when I can. Folks, if you're looking for some gems you need to visit this store. It's on the Gort Road Business Park in Ennis. And. It's. Huge. There's everything from books to furniture to be found here so it's definitely worth your time visiting. And there's parking. Lots of it and did I mention it's free!! So go empty your car boots out and come visit us. 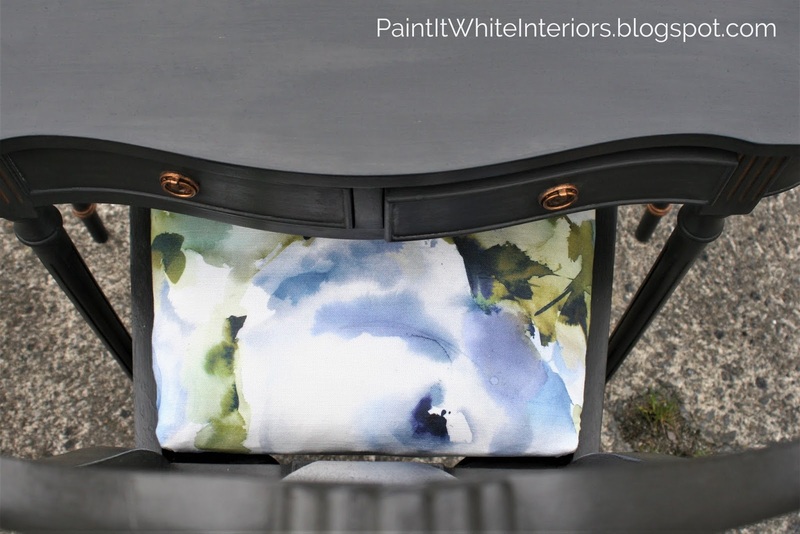 Below is a photo of some of the furniture after I've painted it but you can just scroll down to see some of the 'before' photos just to give you an idea of what you can do too with a little paint, a little fabric and some imagination. Go for it.. Oh and if you have a few hours a week to spare and would like to meet new people while giving to a good cause we are always looking for new volunteers. Sure go on. It'll be great fun.. Even though all these pieces look like they are part of a set they're actually just random pieces in completely different styles that I collected from around the store and unified with a tin of paint. You can see the 'before' photos below and if you are local to Ennis, these pieces will be for sale in the store with the proceeds going to a very good cause. 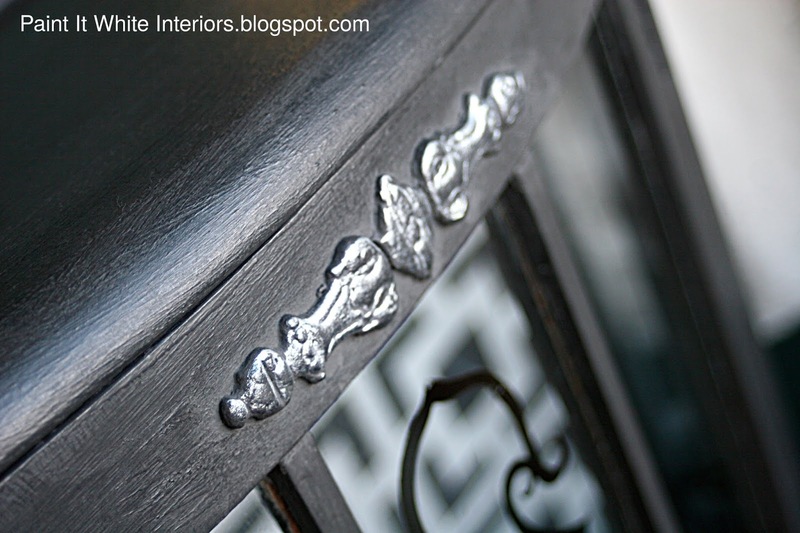 Above: Details of a little desk and chair.. You can see the 'before' if you scroll further down. 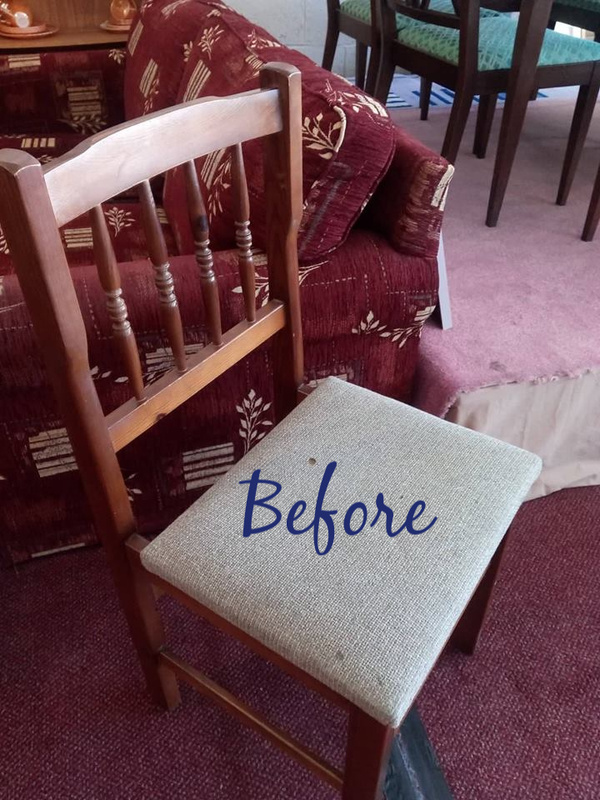 All the furniture is painted with Annie Sloan Chalk Paint which I use because there is no need to sand your furniture first. Just paint it straight on. 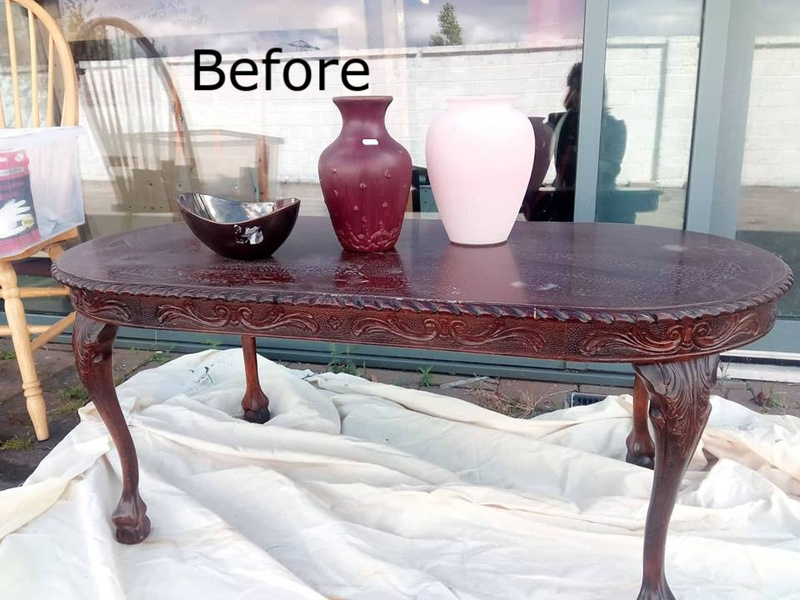 You can seal with wax which I did here but for table tops I have switched to using Annie sloan Lacquer as I found it gives a more durable finish which keeps the surface from scuffing up to easily and it's way easier to wipe clean. Above is the paint I used on all the furniture. 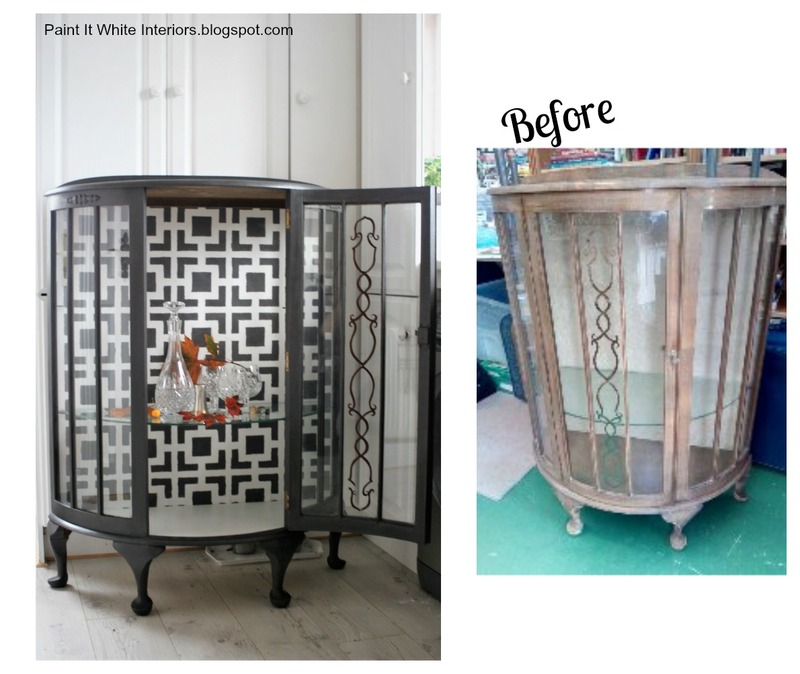 I used the colour Annie Sloan Graphite on most of the furniture but I used the colour Annie Sloan 'Olde White' to stencil the back of the cabinet. See below. 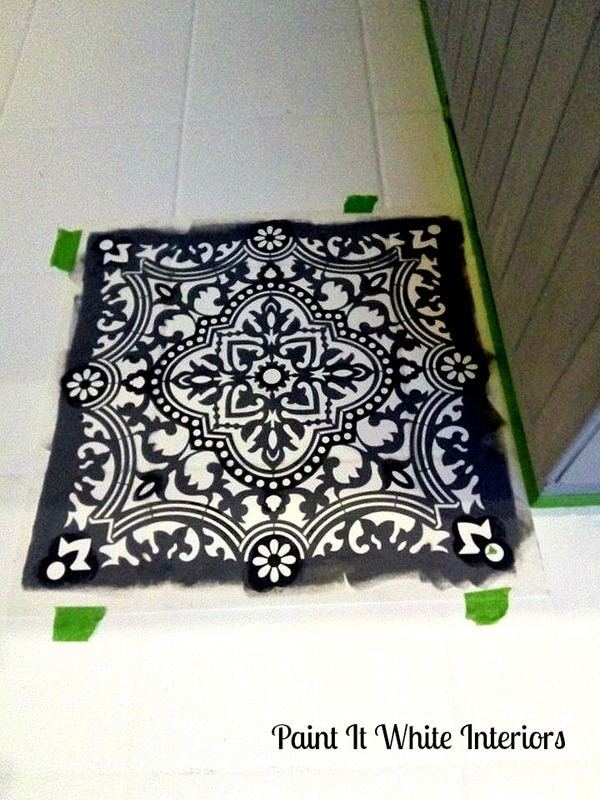 This is the stencil I used for the above cabinet. I ordered it online from Royal Design Studio Stencils They are an amazing site and well worth a visit to get a ton of inspiration and see what's new for 2019. Above: Desk before it was painted. Scroll up to see the 'above'. Chair 'before' You can see the 'after' photo above.. Above: Table before. Scroll Up to see the 'after'. This is a little glass cabinet I painted for our local charity, Clare Haven Charity Shop in Ennis, County Clare. 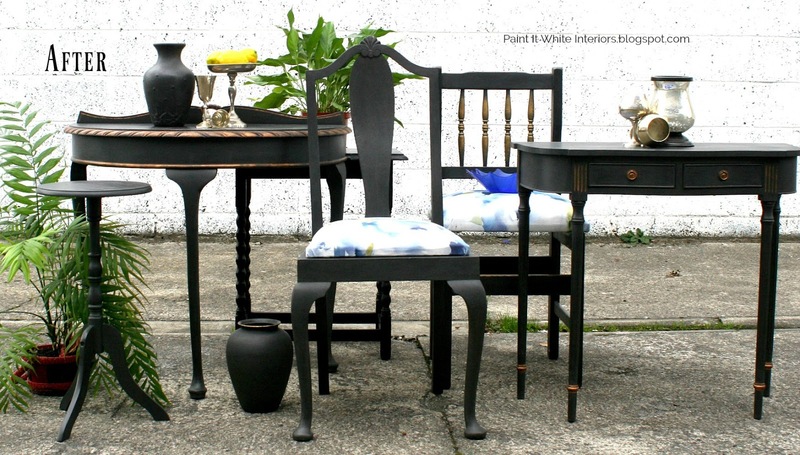 This is one charity shop well worth a visit if you are looking for your next makeover project. 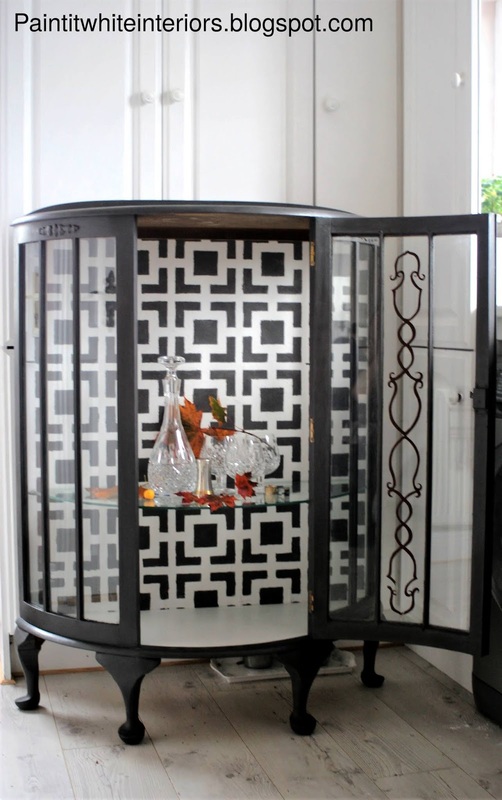 You'll find a huge showroom full to the brim with furniture of every description so it's well worth a visit. And did I mention there's free parking. Lots of it! So come have a look. 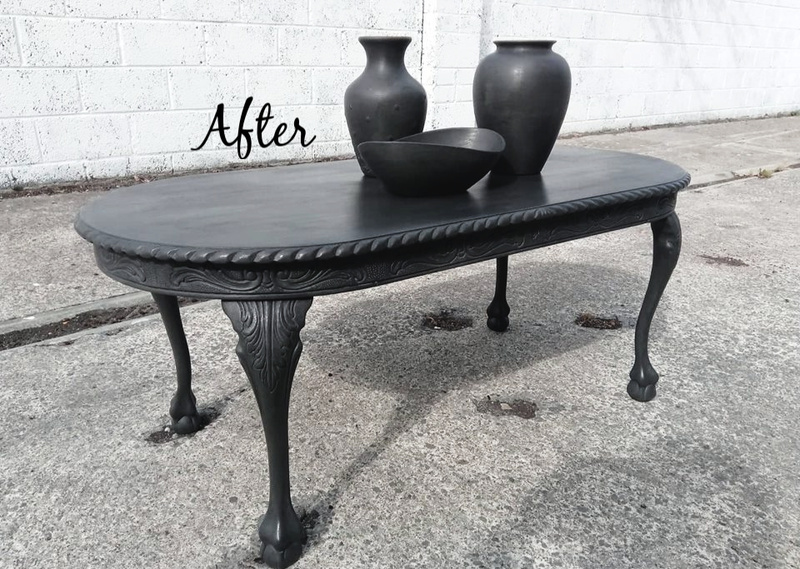 This particular piece was a little banged up and scratched and missing some veneer in places so for the outside I gave it a few coats of Annie Sloan's 'graphite gray' chalk paint with a coat of dark wax to finish. 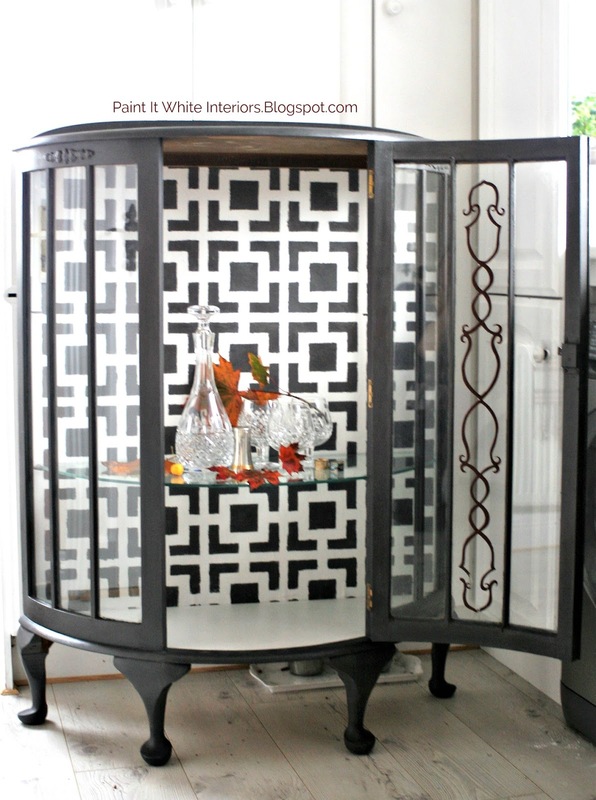 Below: Photo of the cabinet before I painted it. 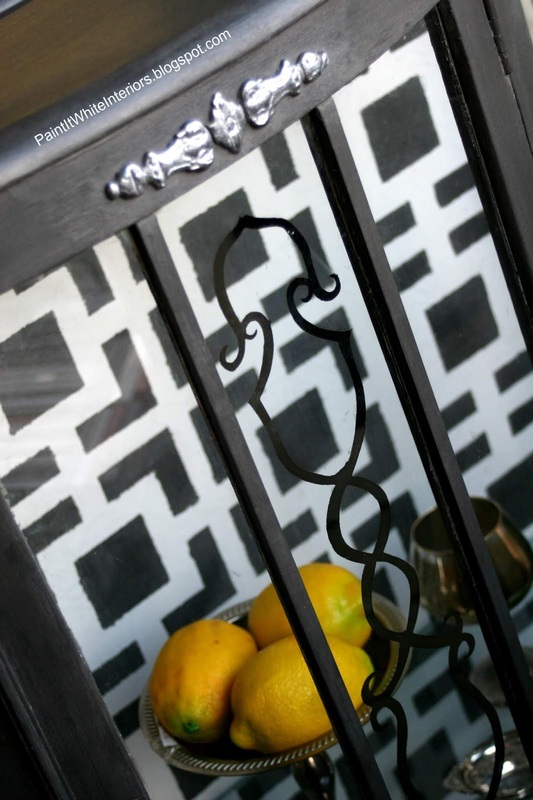 The inside back of the cabinet is painted with the same 'graphite gray' colour combined with Annie Sloan's 'olde white' chalk paint and the design is stenciled on using a stencil from Royal Design Studio Stencils. These stencils are so easy to use but you'll find more ideas and tutorials on their website which is worth a visit to get tons of inspiration. 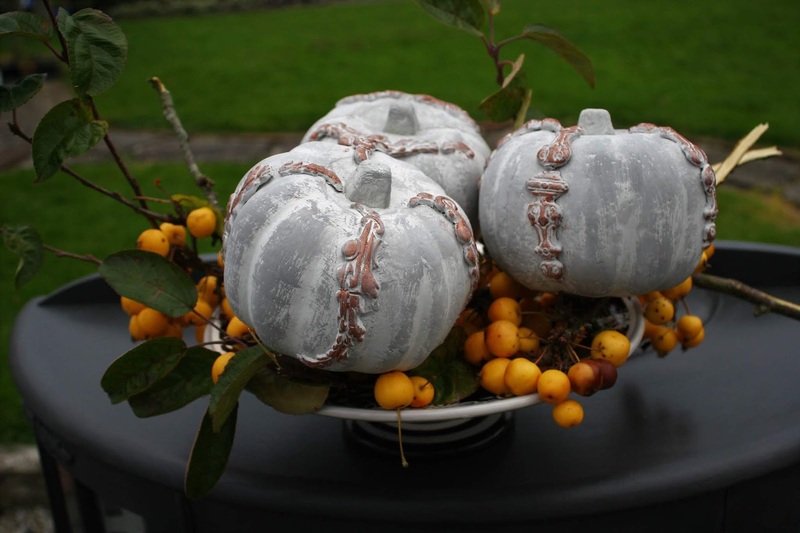 And just for a little something extra I added these decorative handmade clay motifs (below) and painted them silver. They were so easy to make using a rubber mould which I bought from Nook and if you'd like to know more about where to buy the rubber moulds and how to use them you can check out Iron Orchid Designs for more Diy ideas and video turorials. I added this silver clay motif using a rubber mould and air drying clay. So easy to use. 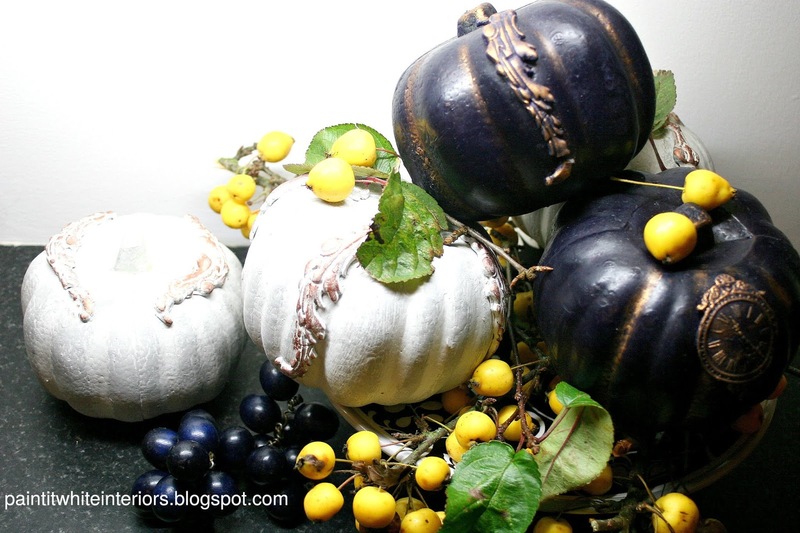 Easy DIY on how to bling up your halloween styrofoam pumpkins! Forever I've been wanting to bling up these pumpkins I found in the Euro shop last year. I just never got around to it so this year when I spotted them again I bought a few more and got to it. 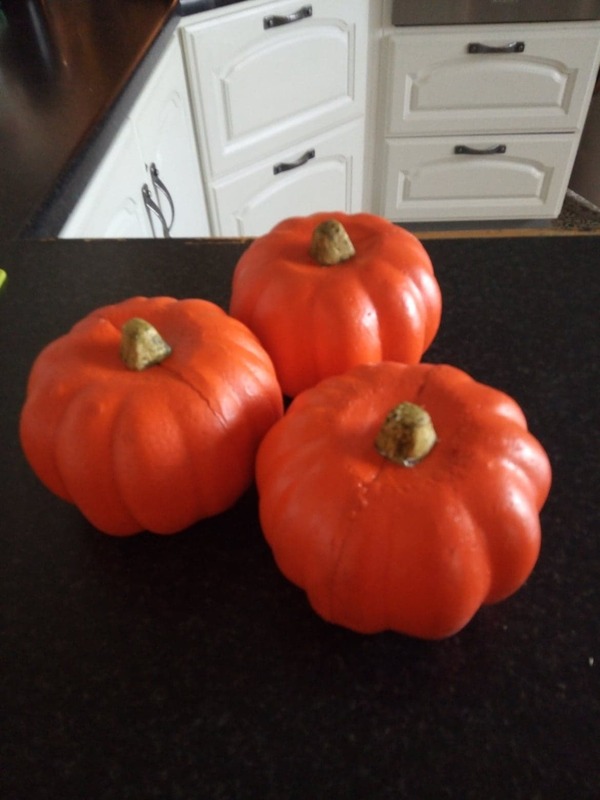 They're just simple styrofoam pumpkins and I wanted to do something a little bit different with them. 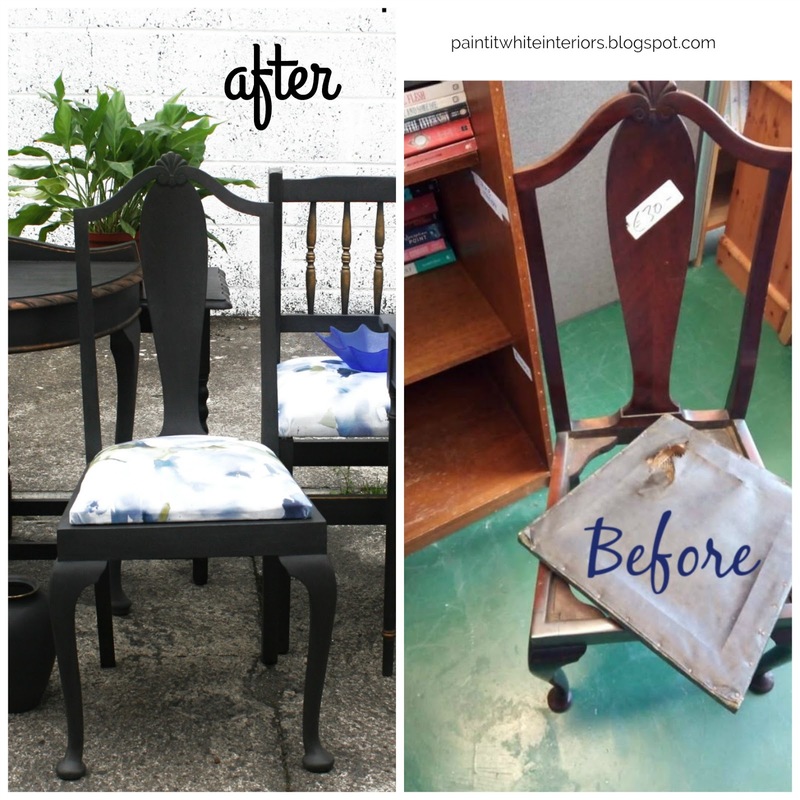 So I painted them with Annie Sloan Chalk Paint in 'Olde White' first and then went over them with a very light gray wash. I made the gray wash by adding a drop of dark gray 'Graphite' paint to the white paint and just brushed it on very lightly over the white to get that stone plaster look. I wanted to add a little something extra to them so I made these little clay appliques using a rubber mould that I bought online. You simply get air drying clay from any craft shop and press the clay into the mould to get your design. I glued mine on with regular craft glue and painted over them. For the final touch I added a touch of gold using Annie Sloan Gilding Wax in 'warm gold'. I simply brushed it on with a small brush and I love how it brings out the design of the appliques. 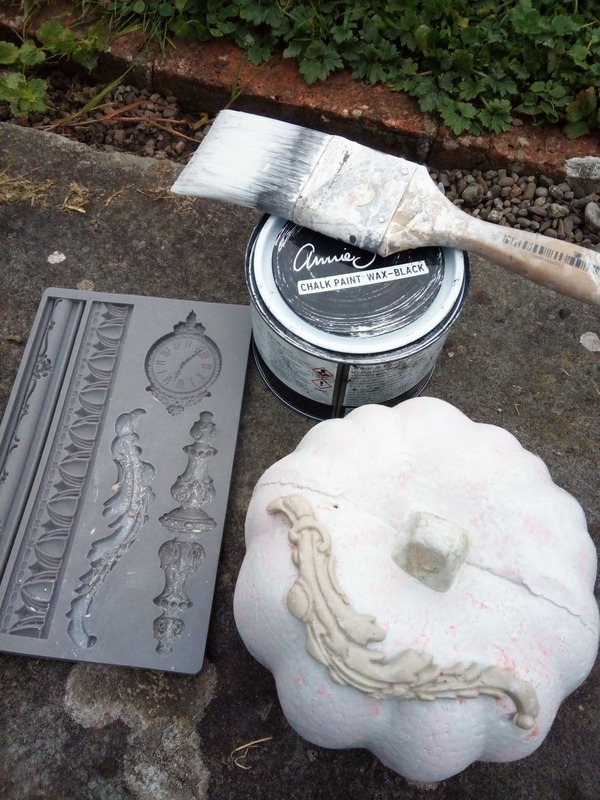 If you do not have a rubber mould you can make your own clay appliques using this Simple Technique that I used before I got the mould and it's just as easy. 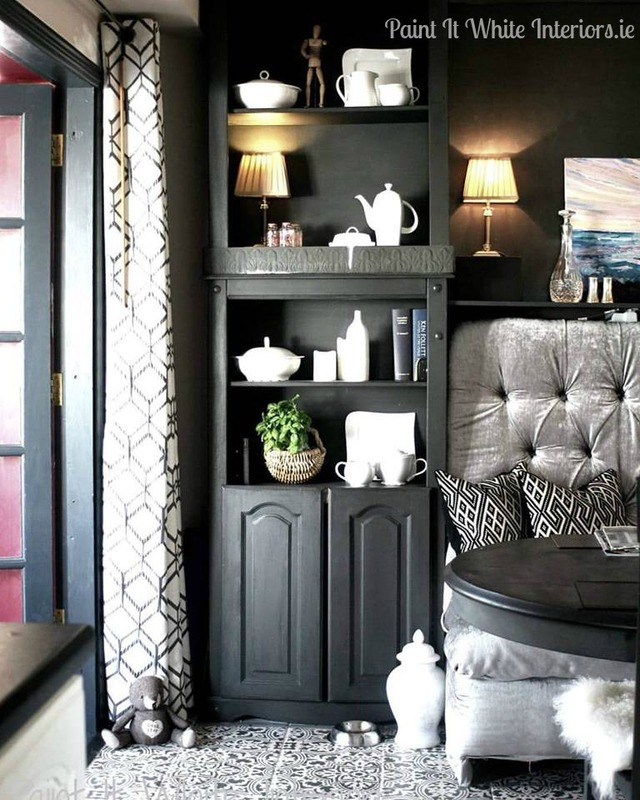 Annie Sloan wax on these ones just to add a little sheen to them. And there you have it. 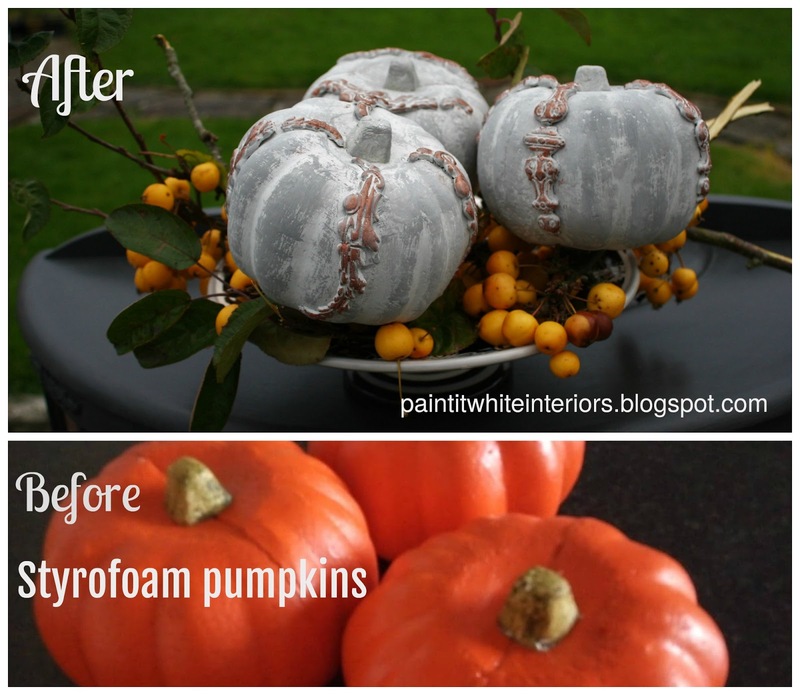 An easy diy to bling up your styrofoam or plastic pumpkins. Happy Halloween everyone .. 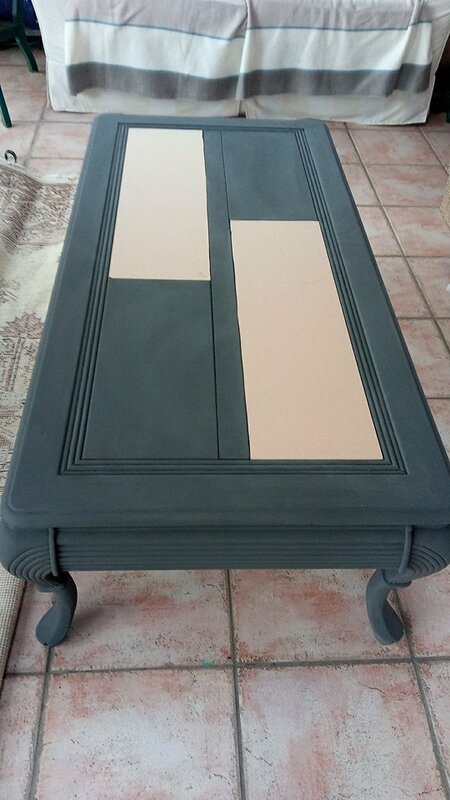 When I came across this coffee table on my travels it was pretty dented and scratched up. 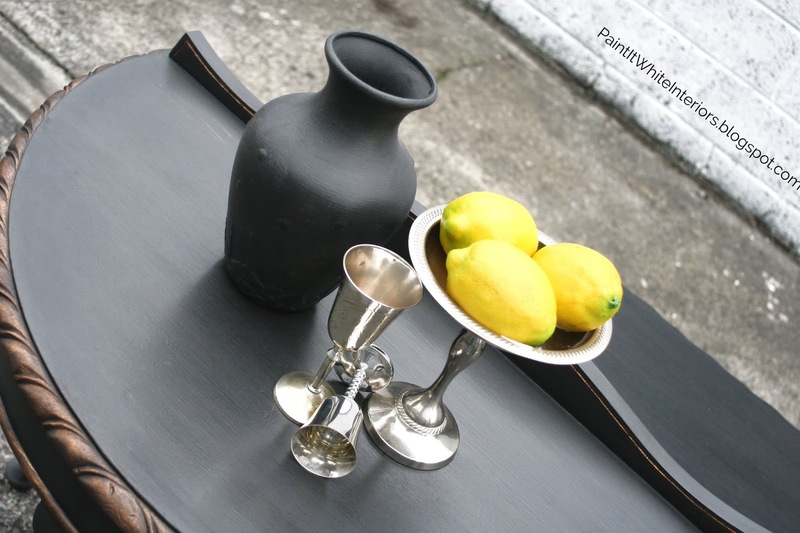 For a while I'd been wanting to try out Annie Sloan's Graphite Chalk Paint with a Black Wax finish so this was perfect for my next project. 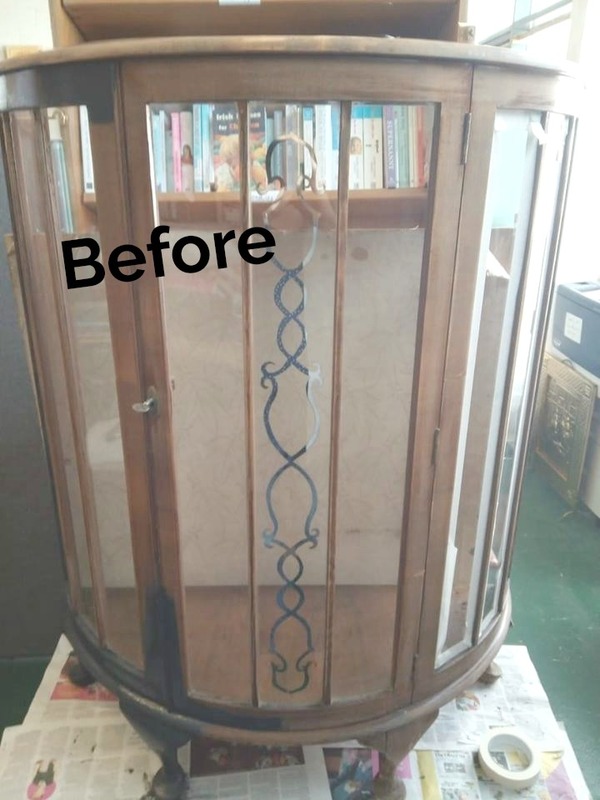 The glass panels were also pretty scratched up so I decided to just take them out and replace them with some MDF board which I bought at the local hardware shop and cut them down to size. 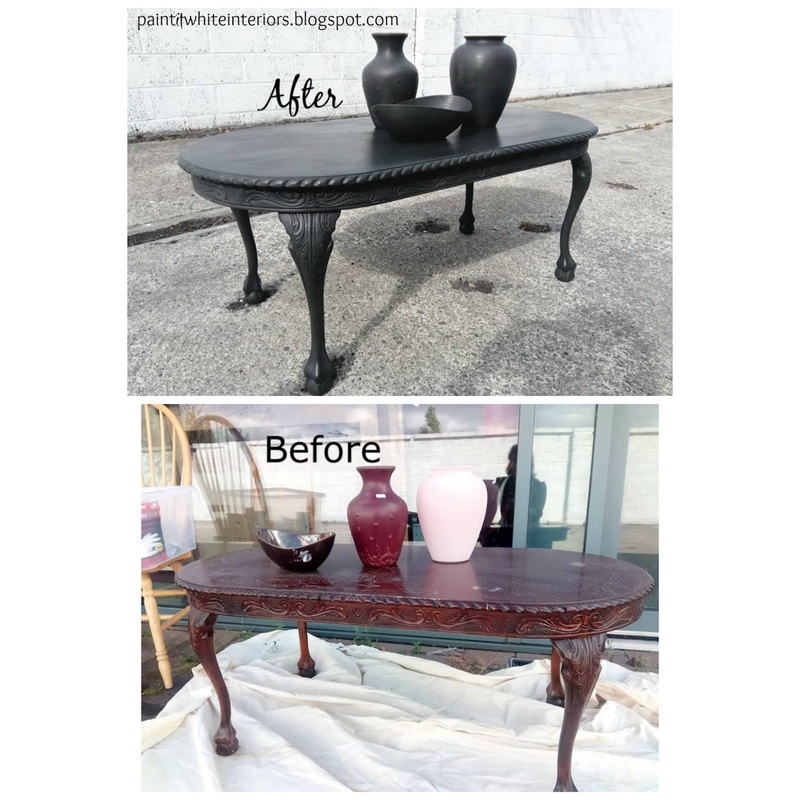 I used these to replace the scratched glass panels and just painted them to match the rest of the table. 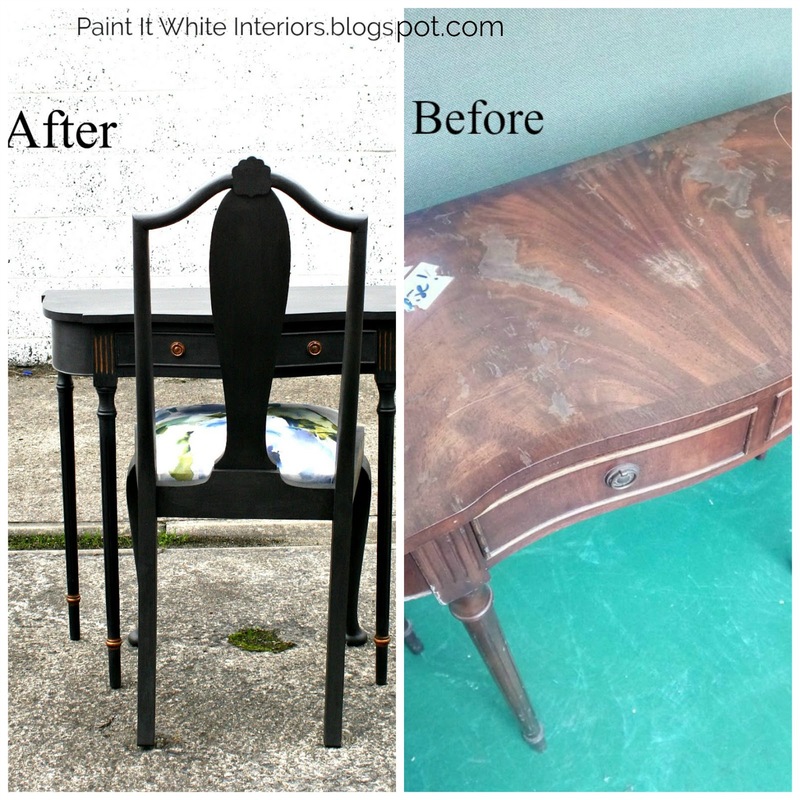 After a good scrubbing I gave it a coat of Annie Sloan Chalk Paint in the colour Graphite and then a custom wax finish. 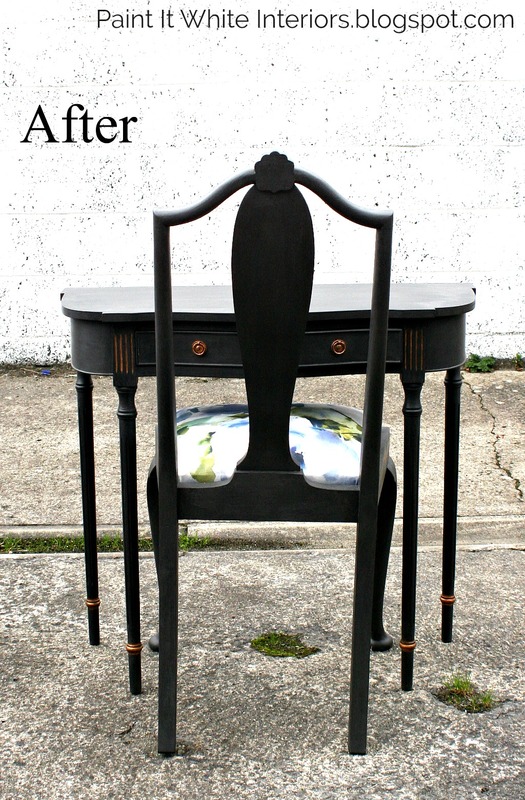 I say 'custom' because it's not a true Annie Sloan black wax. I didn't have any black wax on hand and rather than wait and buy some I decided to add a little black paint to my dark wax and I think it came out perfect. 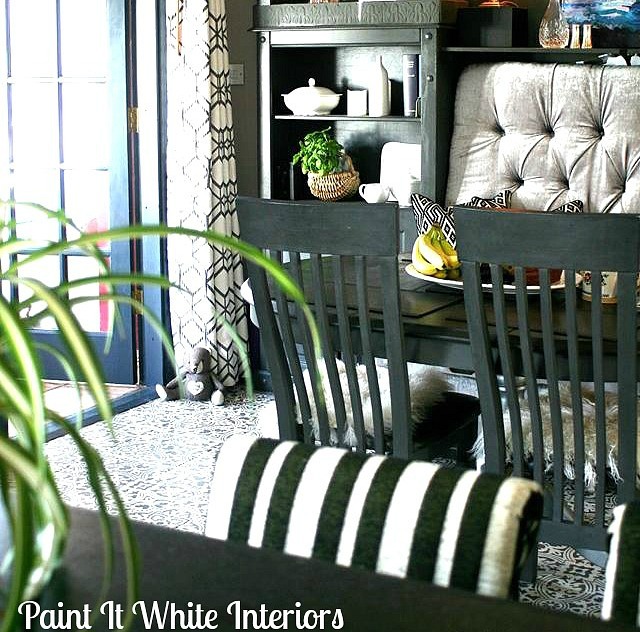 It's perfect for our sun room where the curtains and seating are a very light colour so the black table is a good anchor for the room. I found these fabulous kitchen bar stools at the charity shop where I volunteer. 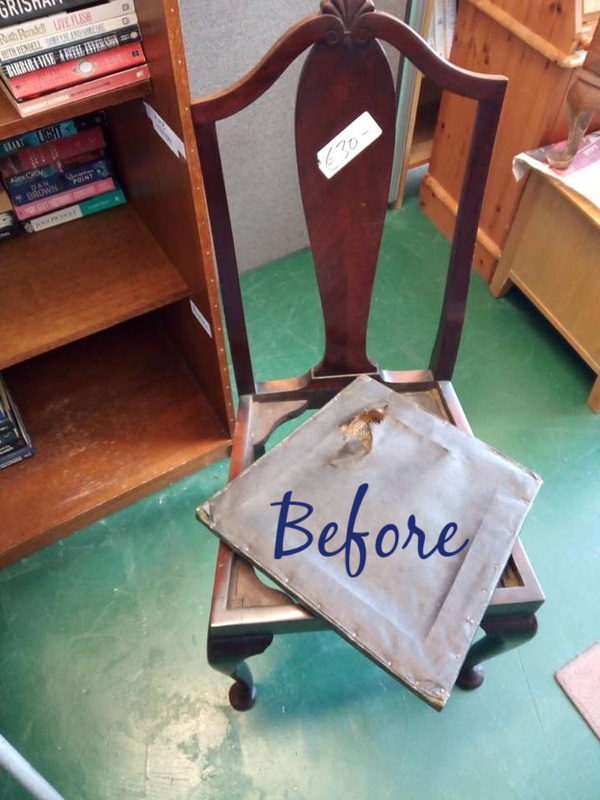 We don't carry any broken or damaged goods at the shop so these were in perfectly good order apart from being quite scratched from lots of wear and tear but with a good scrubbing they were ready to be made over. 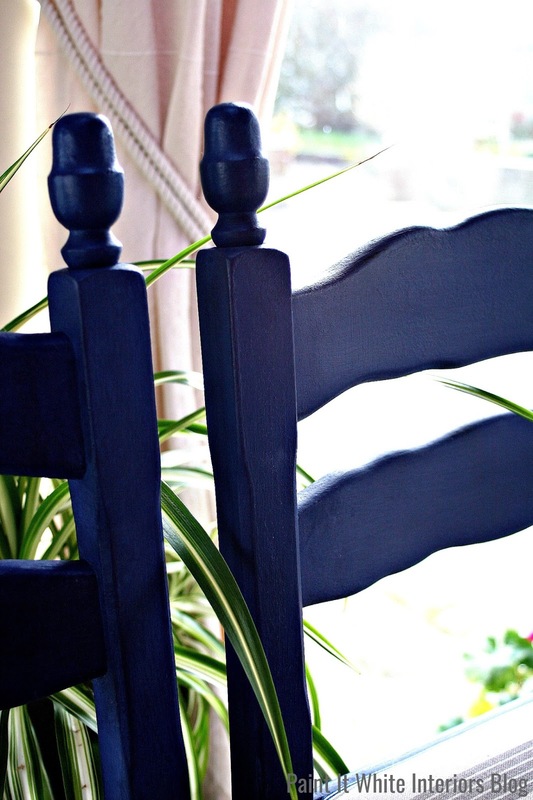 I gave them two coats of Annie Sloan Chalk Paint in Napoleonic Blue simply because I just loved the colour and I've been wanting to try it out ever since she brought it out some years ago. 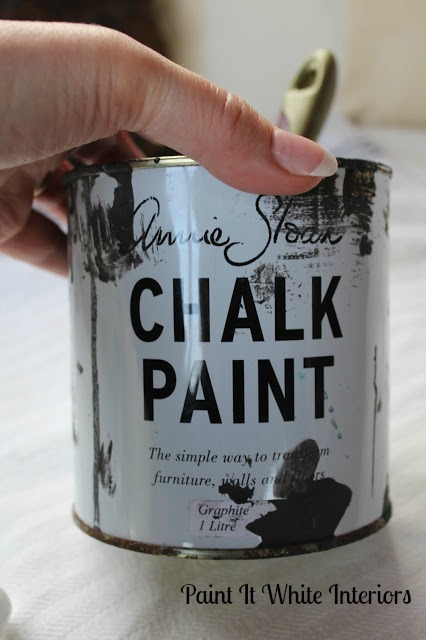 You do not have to sand down your pieces when you are using Annie Sloan Chalk Paint because it has a built in primer that will stick to anything. 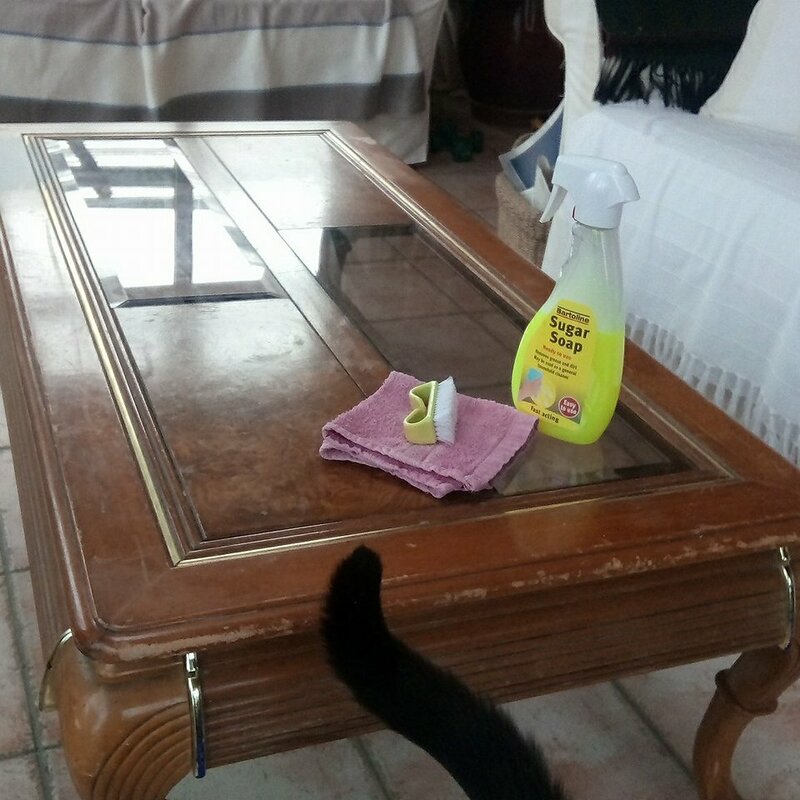 You do however have to wax your piece afterwards if you want to add an extra layer of protection and sheen. If you look closely in one of the more detailed photos below you'll see that gorgeous sheen I'm talking about. I feel you can only get that from adding a coat of wax and buffing it. 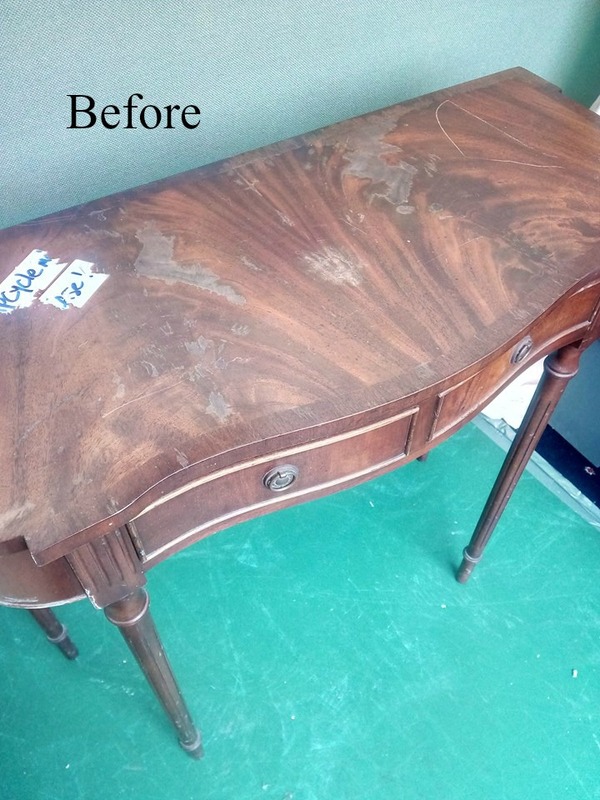 It's a simple and easy step and it's the perfect trade off as opposed to painstakingly sanding your piece and dealing with all that dust. I forgot to get a photo with the seat pads in but believe me they were ugly. Brown, torn, old and ugly! 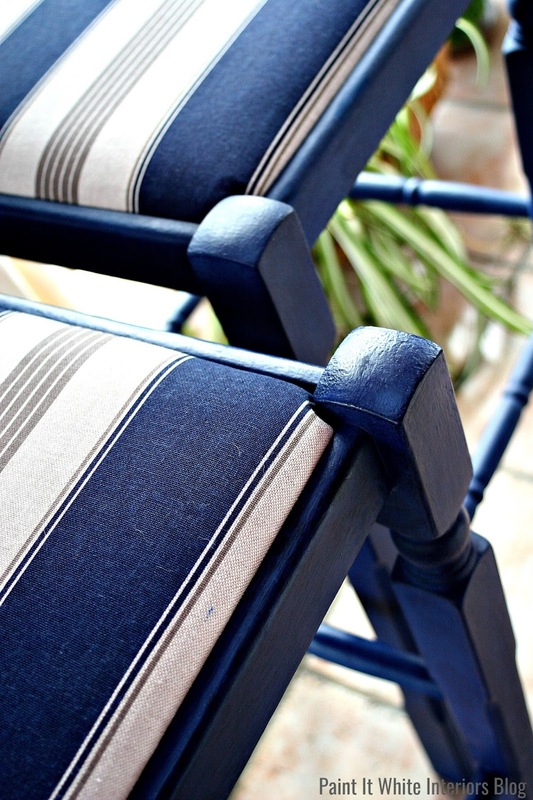 I recovered them with a cotton linen mix fabric I found online. 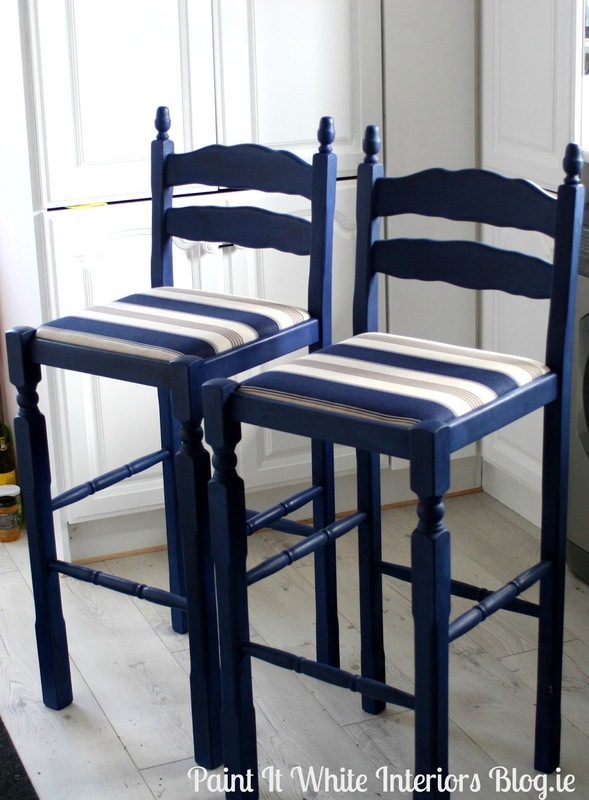 Once the stools were painted I gave them a few coats of dark wax and buffed them up with a clean rag to get that beautiful sheen. 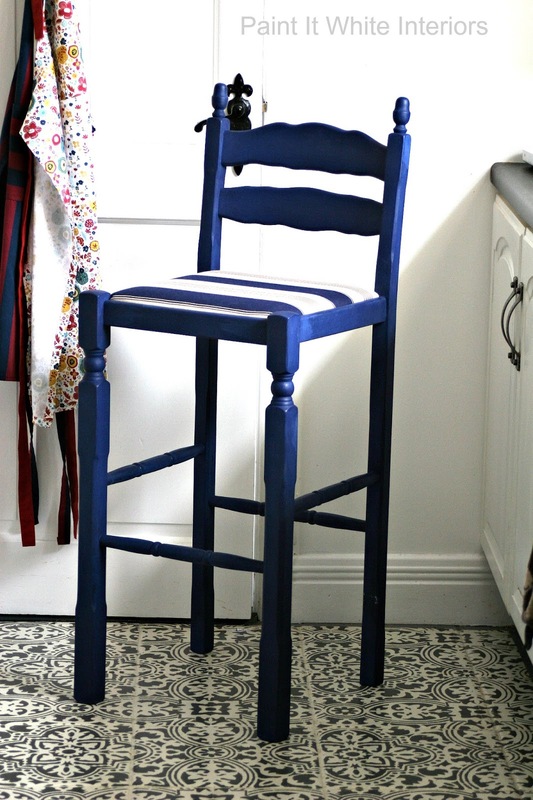 I wasn't sure what to do with them for a while once they were painted but then when my husband saw them refinished he thought they would look perfect in our holiday home in Mayo. Why didn't I think of that! The ones we have up there are quite plain with no backs on them so these will fit perfectly and be way more comfy. I got so stuck into this project that I forgot to take a proper before photo of the floor but I found this one above from my mobile phone. It's a bit crappy but you get the picture. 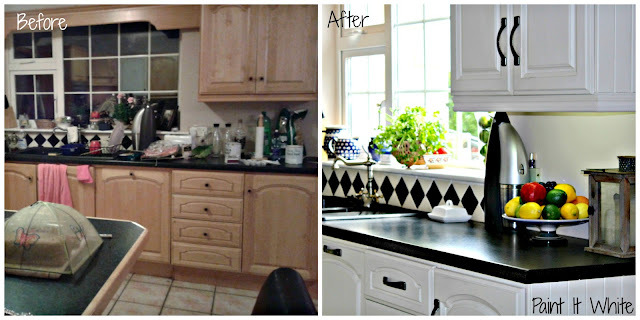 I took it when trying to decide if I would paint the cabinets gray or not... but sin scéal eile. 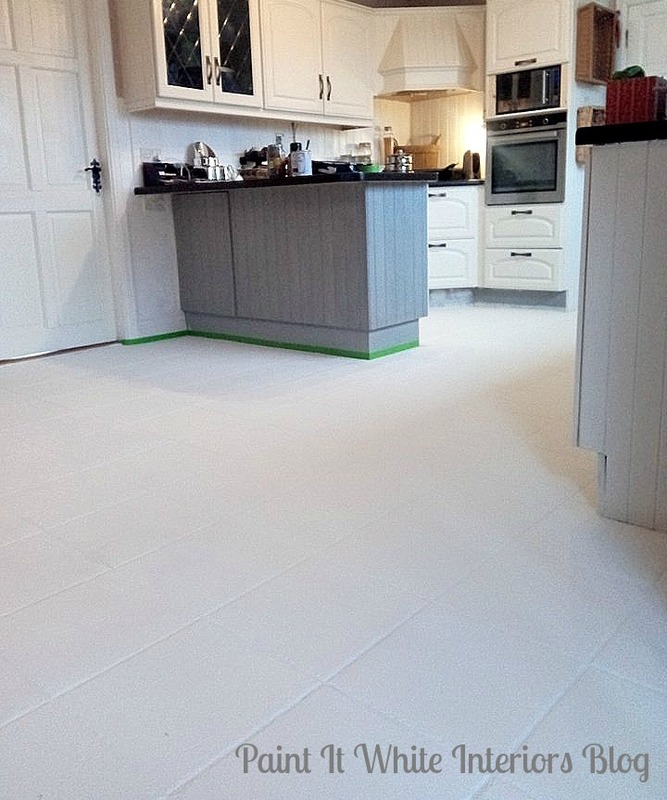 I was a bit nervous about whether to paint our kitchen floor tiles or not because even though I love the look the more practical side of me said, but how long will they last??? Well let me tell you! Over one whole year later it has 100% held up to my expectations. It's still scratch free and perfect and here's how to do it. I used protective felt pads to stick to the bottom of the chair legs to protect the floor from being scratched. 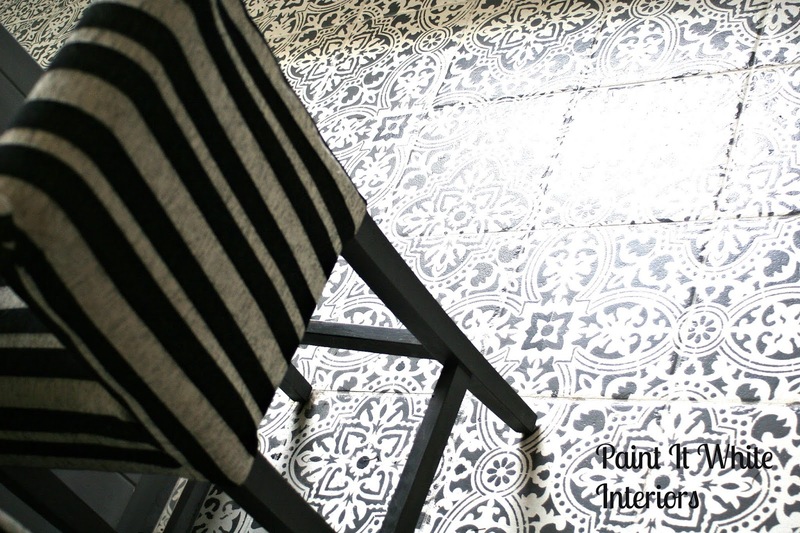 Priming and sealing were the two the most important factors in stenciling this floor. And knee pads! Ya need good knee pads! 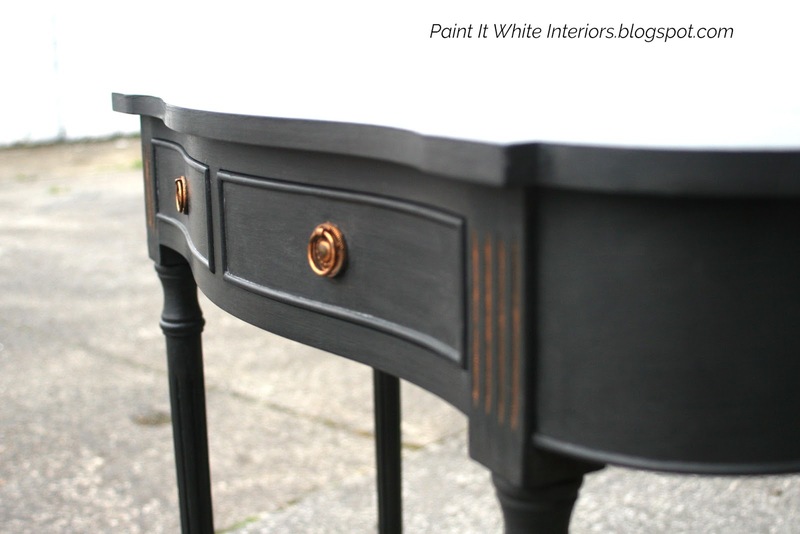 For the colour I mixed a tin of Annie Sloan Graphite Chalk Paint with a little of the Olde White Chalk Paint until I got the exact light gray colour I wanted. You can just use the Graphite as it is if you'd like but I wanted a slightly lighter gray. Use masking to hold the stencil in place and if you use a good quality tape like frog tape (the green one) you can reuse it as you move the stencil along which saves so much time. 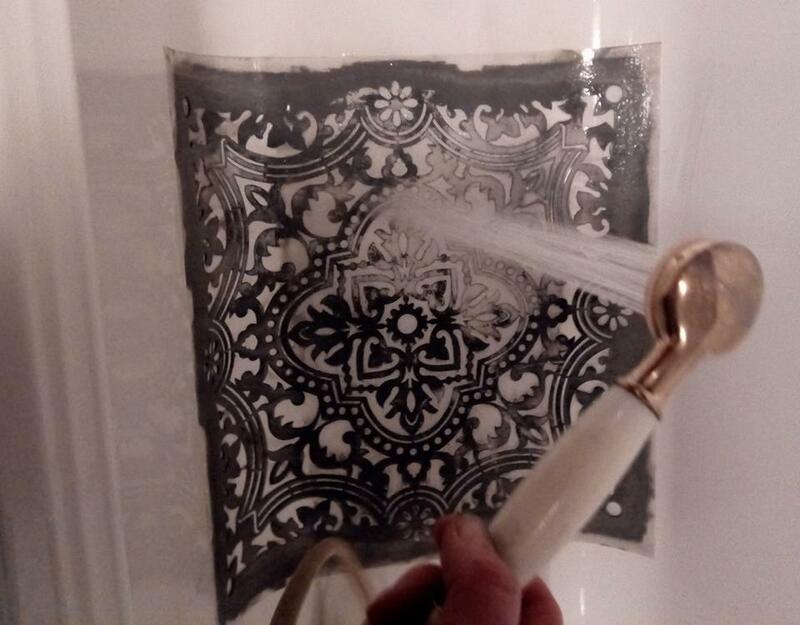 After about five or six uses I tended to get a build up of paint on the stencil so to clean it I just popped into the shower and hosed it clean. 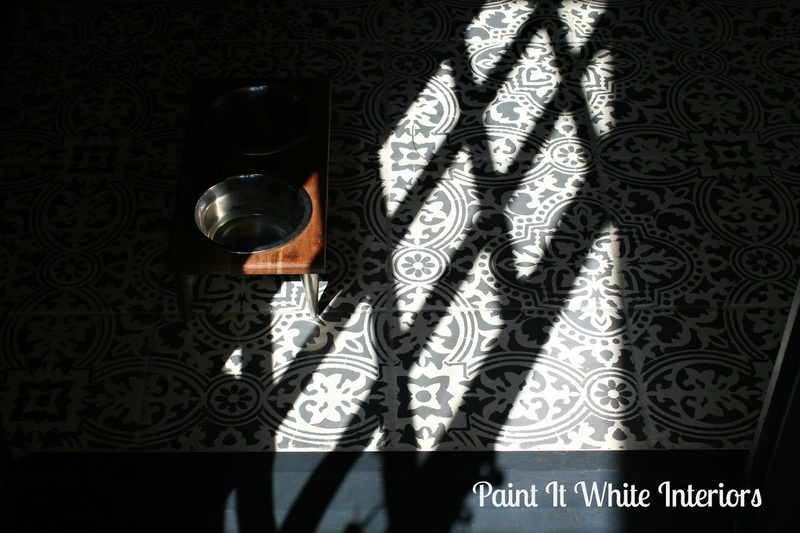 I used a paint tray and foam rollers for each step of this project from priming to painting to stenciling and sealing. 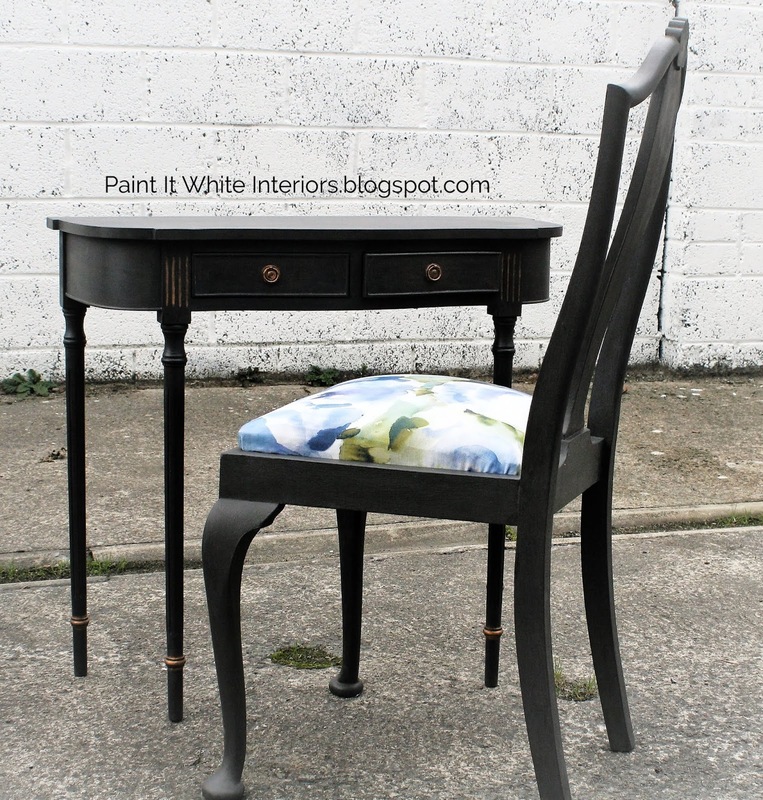 For the stenciling part I used Chalk Paint by Annie Sloan in Graphite. 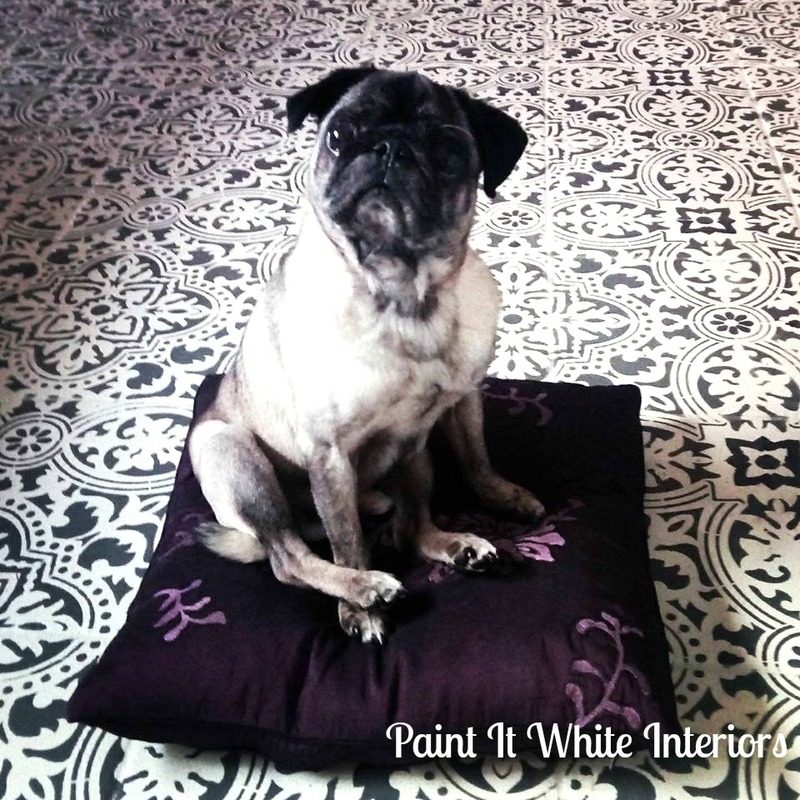 When I finished stenciling the whole floor I then applied the sealant. 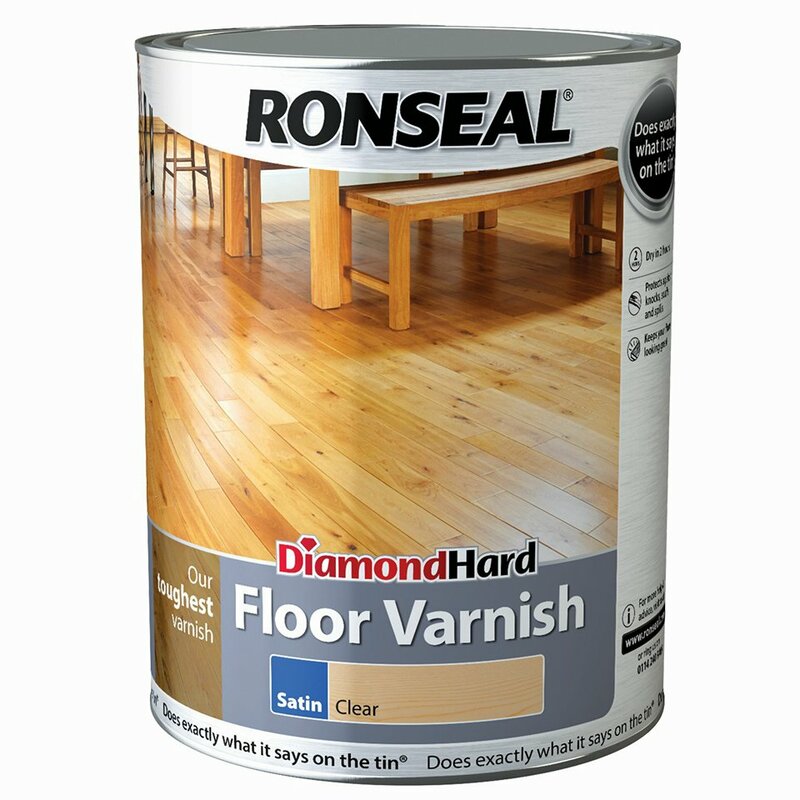 I used Ronseal Diamond Hard, Floor Varnish in Clear Satin on our floor. 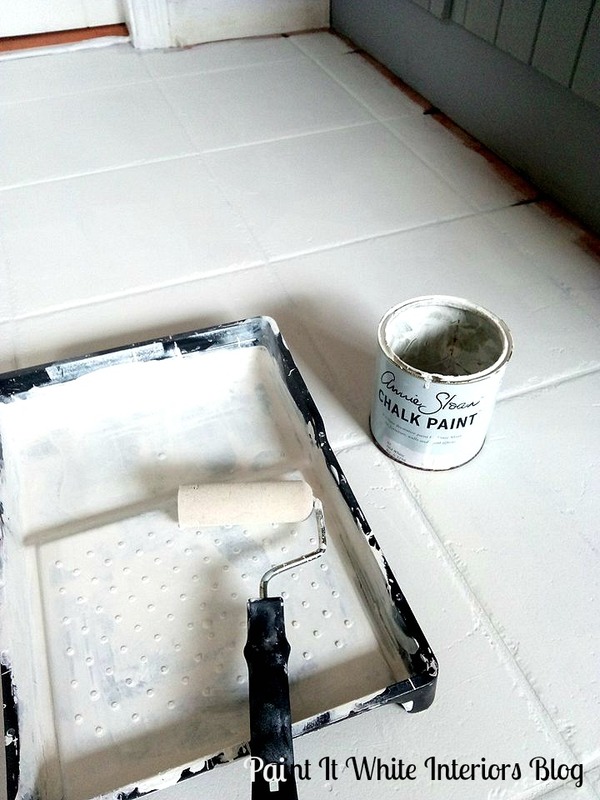 The sealing part is probably the most important part of painting any floor where there is going to be a lot of traffic. If you do try this project just make sure it says 'our toughest varnish' on the front of the tin. 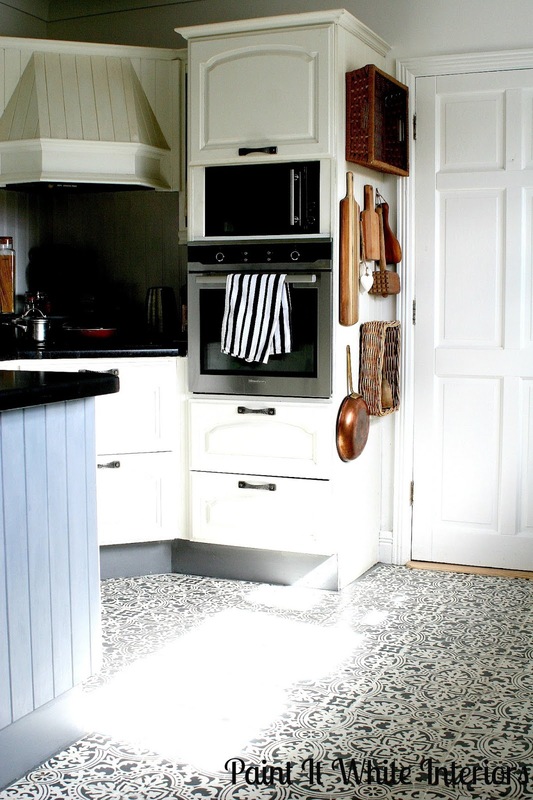 You will see this written on the front of the tin on the bottom left (see the tin above) This is the one you want to get that tough protective finish on the floor and keeps it from scratching or scuffing too easily. There are tons of varnishes out there but I found this one to be the best. It goes on so easy and it's not thick and tacky so it gives you more time to work with it. It was the easiest part of this project really as it's clear so no worries about mistakes or smudges. Just slap that stuff on. The tin suggests using a 4 inch brush but I used a roller and it worked out fine for me. 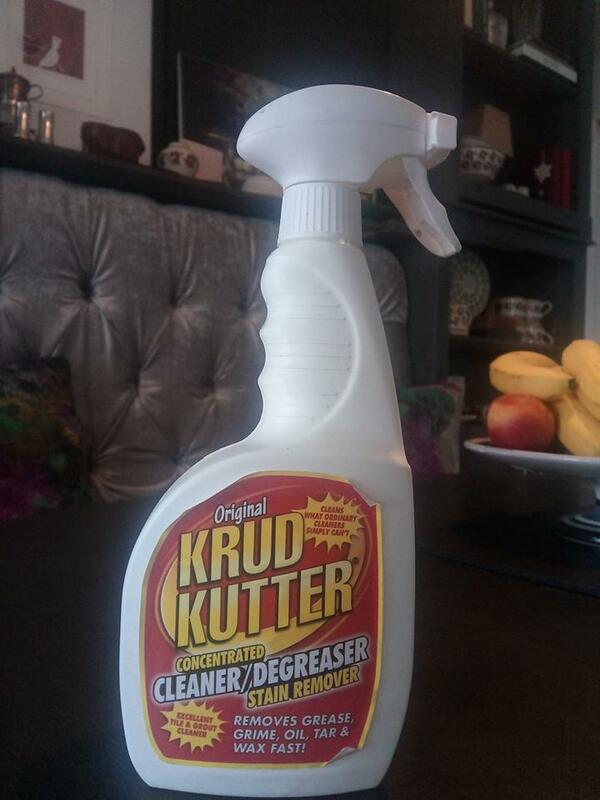 I think they recommend a brush as I found that the foam roller can cause bubbles in the coat of varnish. So I used a new roller for each coat to avoid this. The foam replacement rollers are so cheap so I would recommend buying four and use a clean new roller for each coat. 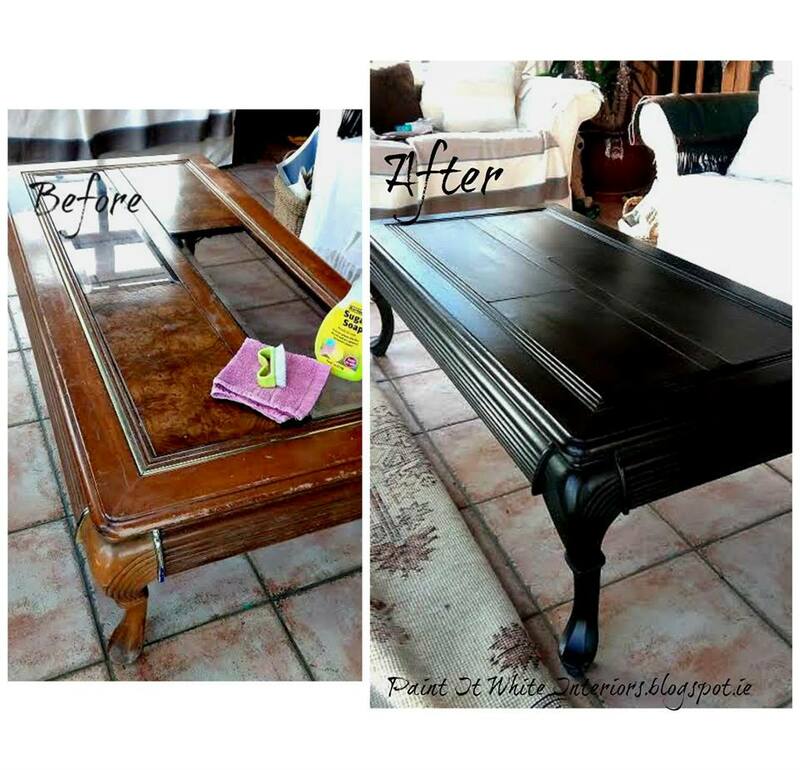 You will need to do four coats of varnish to get a tough hard wearing finish. But like I said it goes on so easy and dries so quickly. Just in case it ever got scratched badly by something sharp I keep a small jar of both the paint colours I used under the kitchen sink so I could easily do touch it ups if needed but I can honestly tell you that over a year later I have never had to do a touch up. 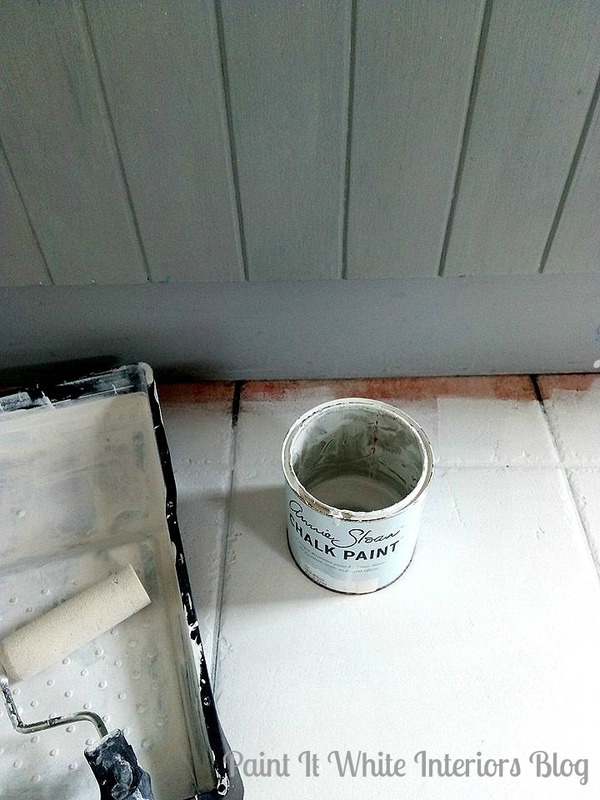 One other thing to note is that I used all water based products and in particular I used a water based varnish (as opposed to polyurethane which can yellow over time) so I stuck with all water based in the hope of keeping the white paint 'white'. Time will tell.. Even my bin primer was water based. You can decipher this easily from the information on the back of the tin. This floor has held up fantastic. Not a scratch or any signs of fading or wear or tear yet. I'm delighted with it. I sweep it, mop it and we do wear our shoes around the house. We have two cats and two dogs but it's holding up just brilliant one year on. 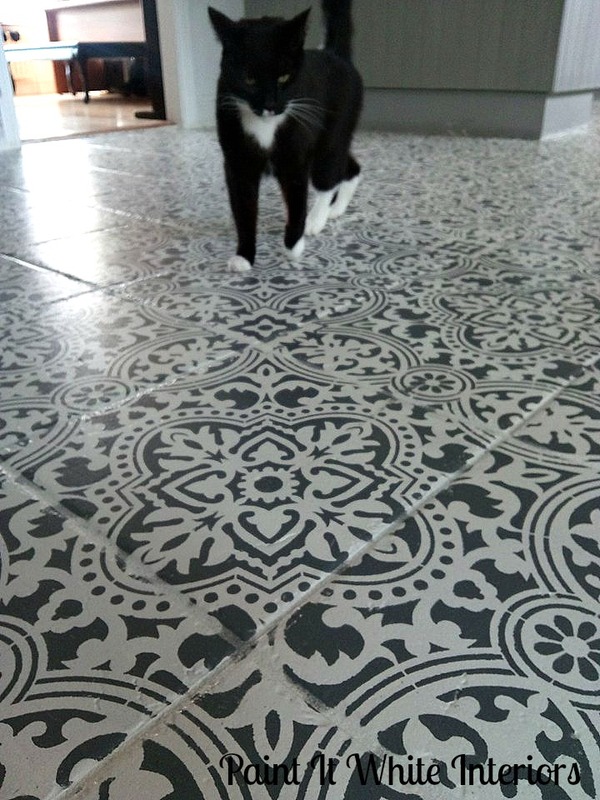 I really thought we would have to revert to plan B which was rip up the old tile (nightmare I'd imagine) and lay down new tile. But thankfully we did not. This is the bomb. 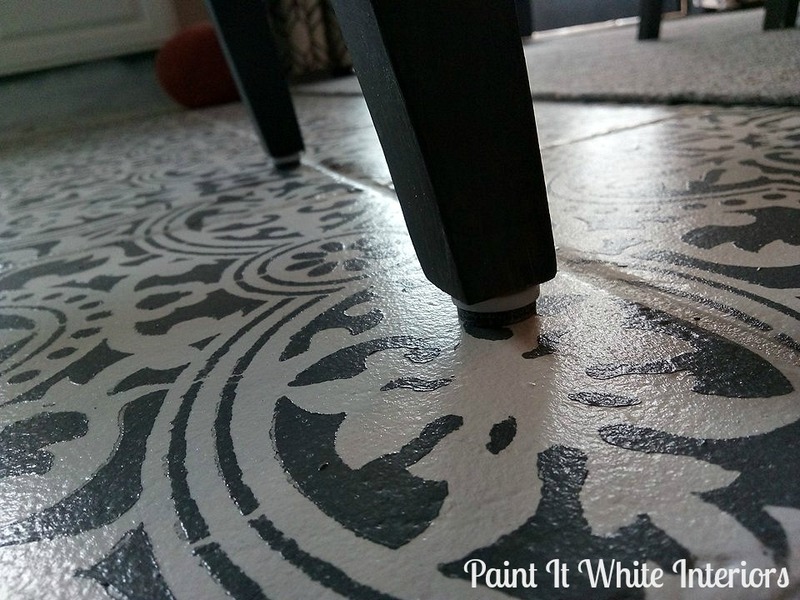 Go paint and stencil your floors and I dare you to tell me you didn't get a massive thrill out of it!! Because I sure did. 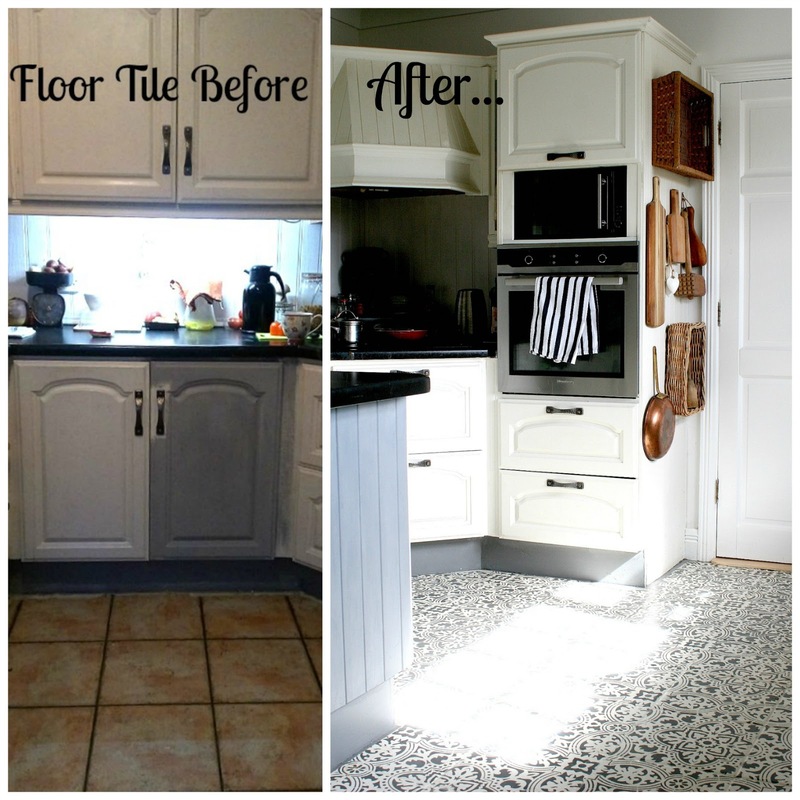 And that's it for this kitchen floor makeover. 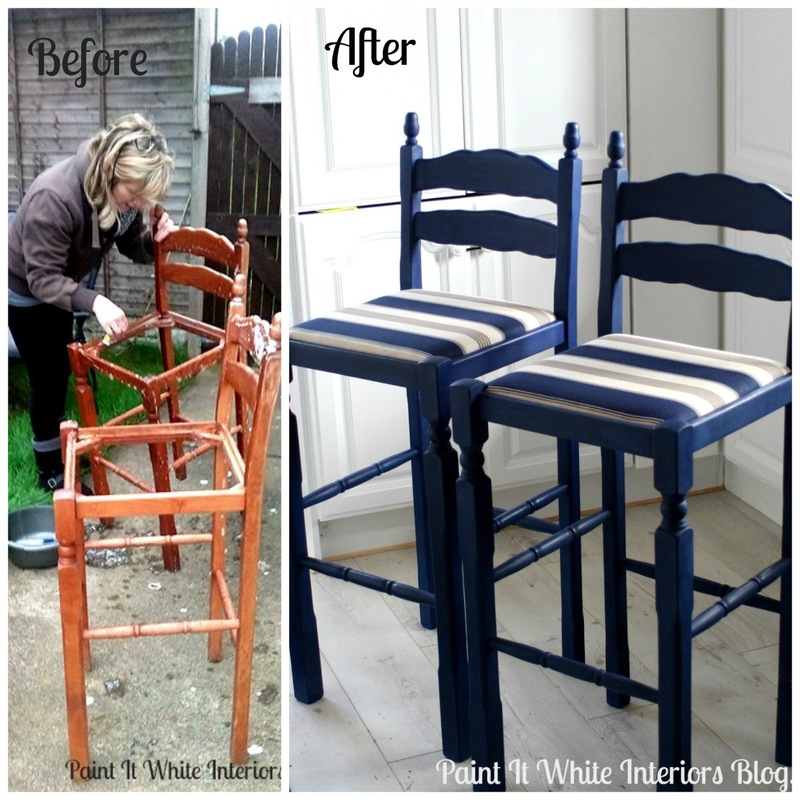 Any questions contact me here or on my instagram account @paintitwhiteinteriors or Facebook Paint It White Interiors.